Angel in the Sickroom: Garfield is this You?! While I was searching for pictures that are related to being a food lover I encountered this picture of this huge (but very cute) cat. Woah! 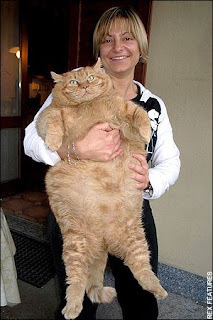 I never knew that Garfield did exist, well the kitty does resemble garfield. What a HUGE house cat. It's surprising that even house pets are becoming obese and are having high risks of death from eating disorders. It's weird how a good and comfortable life would have it's own share of negativity... ah the old rule of Ying and Yang... Without balance there is chaos.